In the judgment of the case – Sugreev Kumar v. State of Punjab & Others , delivered on March 15, 2019, Justice Abhay Manohar Sapre and Justice Dinesh Maheshwari, at the Supreme Court , have held in the “totality of the circumstances” of this case, rather than dilating further on the evidence, that it would be sufficient for it to observe for the present purpose , that the prayer of the prosecution for proceeding against other accused persons, having not being examined in the proper perspective and with due regard to the applicable principles , deserves to be restored for reconsideration by the trial court. The provision contained in section 319 Cr. P. C. sanction the summoning of any person on the basis of any relevant evidence as available on record. However, it being a discretionary power and an extraordinary one,is to be exercised sparingly and only when cogent evidence is available. The prima facie opinion which is to be formed for exercise of this power requires stronger evidence than mere probability of complicity of a person .The test to be applied is the one which is more than a prima facie case as examined at the time of framing charge but not of satisfaction to the extent that the evidence,if goes uncontroverted , would lead to the conviction of the accused. While applying these principles to the facts of this case, the Court has been of the view that the consideration of the application under section 319 Cr.P.C. in the impugned orders had been as if the existence of a case beyond reasonable doubt was being examined against the proposed persons . In other words, the Trial Court of Addl. Sessions Judge, Fazilka and the High Court of Punjab and Haryana at Chandigarh have proceeded as if an infallible case was required to be shown by the prosecution in order to proceed against the proposed accused persons. That had clearly been an erroneous approach towards the prayer for proceeding against a person with reference to the evidence available on record. The appellant (Prosecution Witness -1) has made the statement assigning specific roles to the proposed accused persons. At the stage of consideration of the application under section 319 Cr.P.C., of course, the Trial Court was to look at something more than a prima facie case, but could not have gone to the extent of enquiring as to whether the matter would ultimately result in conviction of the proposed accused persons. The other application moved by the prosecution after leading of further evidence in the matter has been rejected by the Trial Court essentially with reference to the impugned orders of July 24, 2014 and July 2, 2018, which are subject matter of challenge in this appeal. The complainant-appellant , in this case, has challenged the judgment and order of July 2, 2018, in criminal revision 2626/2014 whereby the HC At Chandigarh , has upheld the order passed by the Addl. Sessions Judge, Fazilka, on July 24, 2014, on an application filed under section 319 of the Cr.P.C. 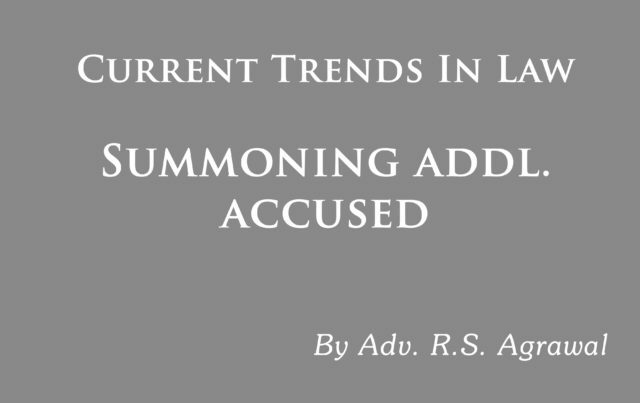 seeking summoning of additional accused persons to stand the trial. The Sessions case is pending trial for the offences under sections 302, 307, 341, 34 of the IPC and sections 25, 54 and 59 of the Arms Act. By the order of July 24, 2014, on the application under section 319 Cr.P.C. ,the Trial Court , while partly granting the prayer of the prosecution to summon one of the accused Sonu Jaipal to face the trial, has dismissed the prayer for summoning the other 7 persons, namely, Krishan Dev, his son Vikash , Rajan, Mukesh alias Jungli, Devinder alias Veeru, Surinder Mahal and Prithviraj. The prosecution case is that on August 29, 2013, the appellant accompanied by his father, brother and other associates, proceeded to reclaim possession of their land from the erst-while tenants in compliance with the directions issued by the Court of Asst. Collector, Grade – I ; that on reaching the site at about 3.30 pm, they found that the concerned revenue officers were not present and while they were making their way back to the village in search of the revenue officers, 3 to 4 cars intercepted them and about 10-12 persons emerged from those vehicles, some of them being the alleged tenants , who were armed with pistols, rifles, swords, dangs, sotas and 12 bore gun; and that after heavy exchange of words, the appellant, his family members and their associates were attacked by the accused persons, which resulted in the demise of the appellant’s father and brother while the others sustained varying injuries with the appellant receiving three bullet injuries. Regarding this incident, FIR came to be filed against 11 persons for the offences under sections 302, 307, 341, 148and 149 IPC as also sections 27, 54 and 59 of the Arms Act. However, after investigation, only 3 persons –Vikram Gilla, Gurmit Singh and Sunil Kumar were charge-sheeted. In trial, the appellant was examined by the prosecution as PW-1. In his cross-examination, the appellant deposed that Krishan Dev, Sonu, Rajan, Mukesh alias Jungli, Devinder alias Veeru, Surinder Mahal and Prithviraj were declared innocent after investigation by the police, but volunteered to state that they were wrongly declared innocent. Pending further cross-examination of the appellant, an application under section 319, CrPC was filed by the prosecution to summon those 8 persons to summon trial on the basis of the testimony of the appellant, wherein he had asserted that all of them were present at the scene of crime; and had assaulted and injured the appellant , his family members and associates on exhortation by Krishan Dev, which resulted in the demise of his father and brother. Hence, it was submitted that there was sufficient material on record to summon all those persons to face trial in the case. In its impugned order, on July 24, 2014, the trial court referred to certain inconsistencies in the testimony of the appellant as compared to his statement under section 161 CrPC and the FIR; and found no case for summoning seven of these persons to face the trial in this case, but considered it just and proper to summon Sonu Jaipal , who had allegedly fired three shots from his firearm , which hit the appellant. The criminal revision application filed by the appellant, against the trial court’s order, dismissing the revision, the HC stated on July 2, 2018 that the petitioner’s counsel had restricted his prayer for relief against Krishan Dev and his son, Vikas and upheld the trial court’s order. The Supreme Court has allowed the appeal in part, to the extent and in the manner that the impugned orders have been set aside and the applications made by the prosecution under section 319 CrPC have been restored for reconsideration by the Trial Court. In the interest of Justice, the Apex-Court has made it clear that it has not pronounced on the merits of the case either way and it would be expected of the Trial Court to reconsider the prayer of prosecution for proceeding against the proposed accused persons totally uninfluenced by any observation herein regarding facts of the case but with due regard to the evidence on record and to the law applicable.